So far in 2018, the company has announced nine acquisitions. The biggest one yet came in late November with a $4.24 billion deal to acquire BTG, a U.K.-based company that develops devices for use in minimally invasive surgery for cancer and vascular diseases, along with acute care pharmaceuticals. The spate of deals come after a low point in 2006, when its deal to enter the defibrillator space through the $27.2 billion acquisition of Guidant was deemed the "second-worst ever" by Fortune, behind AOL's purchase of Time Warner. The company, rebounding from missteps several years back, spent the year scooping up deals and expects growth at 8% at the year's end. Against a backdrop of endless pricing pressure on its workhorse stents and pacemakers, Boston Scientific engineered above-industry growth in 2018 by building on leadership in smaller but faster-growing pockets of the medtech landscape. Its neuromodulation, endoscopy, urology and peripheral interventions businesses are all generating double-digit revenue increases, driving company-wide growth to an expected 8% finish for the year. Boston Scientific is aiming higher still, targeting compound annual revenue growth in the range of 7% to 10% over the next two years. "They've come from being one of the worst performing large-cap medtech companies to being one of the best performing. It's been a long road," said Needham & Co. analyst Mike Matson. 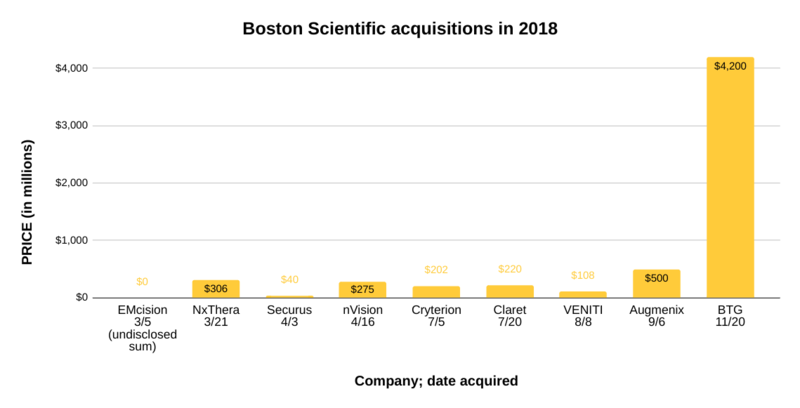 A well-stocked pipeline of new products and steady flow of tuck-in acquisitions has helped Boston Scientific diversify its portfolio into higher-growth markets. The company announced nine acquisitions over the past year and continues to scout for new opportunities. Late last month, it struck a $4.24 billion deal to acquire BTG, a U.K.-based company that develops devices for use in minimally invasive surgery for cancer and vascular diseases, along with acute care pharmaceuticals. By 2020, Boston Scientific expects only 25% of its sales to come from low-growth devices such as drug-eluting stents, pacemakers and defibrillators. Not bad for a company whose 2006 deal to enter the defibrillator space through the $27.2 billion acquisition of Guidant was deemed the “second-worst ever” by Fortune, behind AOL's purchase of Time Warner. After battling recalls and lawsuits stemming from the Guidant acquisition that stretched on for years, Boston Scientific by the early part of this decade was struggling to stem eroding sales. Enter President and CEO Mike Mahoney. Hired in November 2012 from Johnson & Johnson, the very rival that Boston Scientific outbid for Guidant, Mahoney re-energized an organization that was on the ropes. "He did a good job of fixing the culture," said Matson. Under Mahoney's leadership, sales have rebounded steadily since bottoming in 2013, and the CEO has set a course toward "long-term, sustainable, high-single-digit revenue growth and double-digit adjusted EPS growth." Mahoney came in after the company had been struggling with some high-profile operational and regulatory issues, said Morningstar analyst Debbie Wang. "It seemed like Boston employees had become more concerned with minimizing complications and determining culpability than taking on the kind of risk that's necessary to invest in innovation and technology platforms," Wang said. "Mahoney shifted this kind of thinking and refocused Boston on innovation to achieve market leadership, which included eliminating the fear that there would be penalties for taking risks." That shift in mindset set the stage for an overhaul of the product portfolio, including a series of acquisitions that have strengthened the company's position in key medical device categories. "He's done an admirable job of picking attractive acquisitions and being disciplined enough to pay reasonable prices for them," Wang said. Amid the transformation, the company announced a big restructuring in November, in a plan that will result in total pre-tax charges of about $200 million to $300 million, Boston Scientific said. The restructuring is expected to start in 2019 and be mostly complete by the end of 2021. Gross annual pre-tax operating expenses are expected to be reduced by about $100 million to $150 million by the end of 2022 as benefits of the program are realized. Key products contributing to the company's top-line momentum include the Watchman left atrial appendage closure device that prevents blood clots in the heart due to atrial fibrillation and the Acurate transcatheter aortic valve replacement (TAVR), acquired in 2017 from Symetis. Acurate, sold in 30 countries outside the United States, is the fastest-growing TAVR device in Europe, according to the company. Boston Scientific recently received approval from FDA for a clinical trial to support the eventual launch of the valve in the U.S. market. The company is closer to launching a second minimally invasive aortic valve, called Lotus, in the United States but faced a serious setback when it withdrew the product from the European market in February 2017 due to malfunctions. After making manufacturing process and design changes for the device, Boston Scientific now expects to reintroduce the Lotus valve in Europe in the first quarter of 2019 and to launch in the United States in mid-2019. A closely watched new product, Lotus is expected to become the third TAVR device to enter the U.S. marketplace, competing with valves from Edwards Lifesciences and Medtronic. Boston Scientific is putting another daunting challenge behind it as well. On its third-quarter conference call, the company said it is close to settling nearly 97% of the lawsuits it faced over the safety of its vaginal mesh implants used to treat stress incontinence. FDA in September 2017 said it concluded after an investigation that the resin used to make the product does not present safety or effectiveness concerns. Boston's sales have benefited from increasing adoption of the WaveWriter spinal cord stimulator in the United State and Europe, bolstered by interest in an alternative to opioid treatments for chronic pain. The device administers electrical pulses to the spinal cord to disrupt pain signals. Another promising technology is the company's Sentinel embolic protection system that catches debris dislodged during a TAVR procedure that could lead to stroke. Boston Scientific gained the device, which is the only product of its kind available in the United States and Europe, through its recently closed acquisition of Claret Medical. Other new products expected to gain momentum are the Eluvia drug-eluting stent to treat peripheral vascular disease, approved by FDA in September, and the Rezum system to treat symptoms of benign prostatic hyperplasia, also known as enlarged prostate. Boston Scientific acquired Rezum in its purchase earlier this year of NxThera.